A century ago, British-Indian forces led by Brigadier General Reginald Dyer opened fire on unarmed innocent lives. Hundreds, including women and children, were present, protesting against the Rowlett Act of the British government Bagh in Amritsar. The 1919 massacre was one of the gloomiest chapters of India’s freedom struggle to gain independence from British rule and has marked its centennial this month. The day also fell on the yearly celebration of the Sikh New Year, otherwise known as Baisakhi. The festival is celebrated all over Indian and also in the UK as marking the birth of the Khalsa (Sikh Religion) by the 10th Guru, Shri Guru Gobind Singh Ji. It is marked by a procession in the streets by followers of the religion, which is led by the faith’s holy book at the forefront; the Shri Guru Granth Sahib Ji. As India honoured the 100th anniversary of the massacre of innocent lives by British forces at the Jallianwala Bagh, people from the film industry, including Amitabh Bachchan and Sunny Deol, paid their tributes to the martyrs. Remembering the horrific incident, Big B had tweeted, “in the remembrance of the killings by the British and determine to rid India of the British Colonial rule”. On the morning of the festival of Baisakhi, Brigadier General Reginald Dyer announced the execution of a curfew in Amritsar and a ban on all parades, that even had forbidden a group of 4 or more people to meet in a public place. In the afternoon, the Brigadier acquired information about a meeting in Jallianwala Bagh, which resulted in protest and riots. Without giving any warning, general Dyer arrived at the Jallianwala Bagh with 90 soldiers and ordered his troops to shoot at unarmed innocent lives. The firing went on for around 10 minutes until Dyer and his troops had their bullets finished. 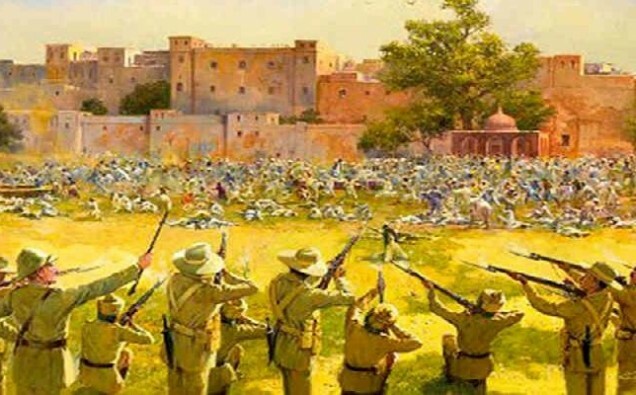 The killing of the peaceful protestors took place on the occasion of the Punjabi New Year (Baisakhi), and now is now known to be as the Jallianwala Bagh Massacre.